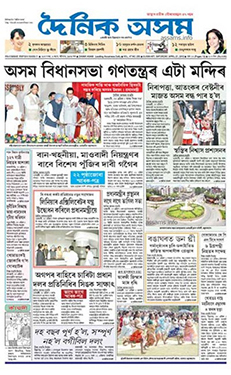 Dainik Asam (Assamese: দৈনিক অসম) is the oldest Assamese daily newspaper. Launched on August 4, 1965, it is owned by The Assam Tribune Group. Dainik Asam was one of the dream projects of late Radha Govinda Baruah, the founder of The Assam Tribune Group. His son, Prafulla Govinda Baruah is the Editor of the newspaper. It has 2 print editions -- Guwahati and Dibrugarh. Dainik Asam Epaper was launched on January 1, 2012, and is also very popular amongst the readers.